In this groundbreaking and boundary-crossing work, Park develops a spirituality of dislocation for Asian immigrant women in the United States. 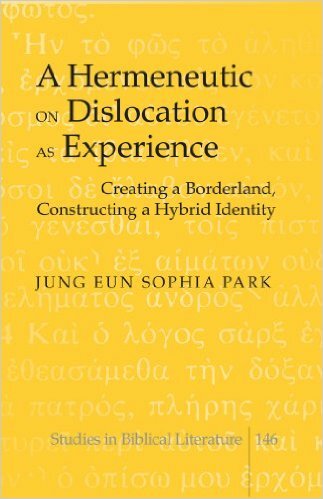 Park situates her work within the fields of Christian Spirituality and postcolonial studies, and demonstrates how both lived experiences and theoretical concepts are helpful models for understanding displacement and hybridity. Alongside her focus on these two disciplines, Park develops a hermeneutic on dislocation through an amalgamation of autobiographical studies, ethnography, and biblical studies. For Park, the initial step of developing a hermeneutic on dislocation is to identify and articulate Asian immigrant women’s experiences of alienation through two autobiographical works: Chuang Hua’s Crossings, and Theresa Cha’s, Dictee. Park chooses autobiographies in particular to articulate narratives of displacement because this literary genre “brings the topic of Asian immigration into the consciousness of mainstream American society” (11). After illustrating the journeys of Asian immigrant women, Park examines how transformation through hybridity is an integral process for developing a spirituality of dislocation that brings forth empowerment. Park discusses this practice of transformation through an ethnographic analysis of a shamanic community in Janheung, South Korea. According to Park, “to be a shaman means living in the liminal, in-between, space” (82). Through her participation in four Shin Kuts, she provides detailed case studies that demonstrate how dislocated shamans gain hybrid identities within the context of the borderland, and ultimately utilize their hybridity as a form of liberation. The Shamans positively transform through social isolation, cultivating deep bonds with friends and family, and developing deep levels of confidence, self-awareness, and freedom (82). Lastly, Park utilizes biblical studies in order to portray how Asian immigrant women’s experiences with displacement overlap with the narratives of women within the biblical texts. She performs a social-rhetorical analysis of John 7:53-8:11, demonstrating how the woman caught in adultery is introduced as powerless, marginalized, and oppressed (104), yet gains a new hybrid identity through her encounter with Jesus. Ultimately, the women’s interaction with Jesus illustrates how a dislocated person who is initially ostracized from mainstream society can become empowered and transformed through engagement with God. The strength of Park’s work is her coherent and organized utilization of various disciplines. Park clearly and explicitly articulates in her introduction and throughout her work how each particular field of study: women’s autobiography, ethnography, and biblical studies provide three distinctive, yet overlapping vantage points for cultivating a hermeneutic on dislocation as experience. Park’s intersections between biblical exegesis and ethnography is particularly innovative. She identifies that the Johannine community is a “community of friendship based on equality and service” (96), and emphasizes how a similar understanding of friendship is present within any Korean shamanic community. For both the text of John and the shamanic community, friendship transforms and protects the dislocated individual and strengthens the society as a whole. Park’s explanation of Asian women’s experiences with dislocation could have benefitted from more examples of lived displacement. On the one hand, her utilization of two autobiographies provides informative real life experiences of dislocation from Asian immigrant women. On the other hand, Park emphasizes in the introductory chapter the importance of acknowledging the plethora of Asian immigrant women’s livelihoods, and how this diversity of experience greatly informs the development of hybrid identities. Choosing only two autobiographies and restricting the analysis of lived dislocation to the autobiographical genre alone does not necessarily highlight in detail the complex and heterogeneous experiences of alienation and isolation. Broadening the scope of inquiry and potentially drawing from works within the fields of diaspora or migration studies that focus on Asian women experiences may have provided more intricate illustrations of the multiplicity of displacement narratives, and how these various lived journeys overlap and diverge. Overall, Park’s monograph is a fine examination of dislocation that demonstrates the necessity of interdisciplinary engagement when addressing questions of identity formation. I would recommend this work for students and scholars interested in Asian and/or Asian American Hermeneutics, postcolonial studies, hybridity, and socio-rhetorical criticism. ‹ Women, Ethnicity, and Asian Modernity: Ruth in Hong Kong?